The month of March ushers in the closing period of the Premiership and commencement of training for all cricketers of the country. However, across the Atlantic it means one thing: March Madness, the annual College basketball tournament which continues to garner huge interest, captivating a TV and, increasingly, a social media audience. This provides an opportunity for brands to get in on the action as official sponsors or otherwise. To put the scale of March Madness in perspective, the TV deal with the governing body the NCAA is currently $10.8 billion over 14 years (bear in mind that’s just 14 months’ worth of coverage!). Although all current activity is primarily for the U.S. market, I thought it would be interesting to run down some of the innovative campaigns over this period, as brands look to integrate their promotions across of forms of media. Coca-Cola has introduced a multitude of platforms to encourage engagement via social media, including texts for prizes during live games, and is also the sponsor of the official social arena, which allows fans to share game content and discuss games with others, accessed via the Coke Zero website. It has also used the opportunity to invest in the marketing of its energy drink Powerade, launching a commercial alongside a Facebook page which offers the chance to win tickets to the Final Game. 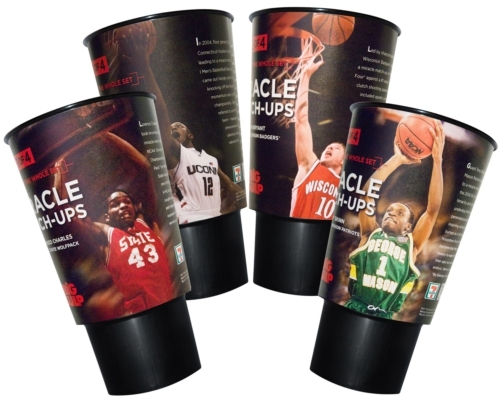 In addition, they have also teamed up with convenience store chain 7Eleven to produce souvenir cups which hold a QR code providing a link to the Powerade website and a video of a selected memorable moment of the tournament, hosted by former players. The Nissan-owned car firm Infinity has launched a campaign involving social marketing and philanthropy. Announced via a promoted tweet, it promises to donate money to the American Cancer Society for every correct tournament bracket pick made via its website. Other sponsors Dominos, Reeces and UPS find their Facebook pages now dominated by March Madness, with opportunities for prizes, encouraging engagement with the brands page during games. Unilever launched Dove’s ‘Journey to comfort’ campaign featuring stories from former and current basketball players. The ad is accompanied by a Facebook page where people are encouraged to share their own stories, a dedictated website and also an app which allows you to send a personal message to Shaq (featured below), interacting with the brand and the personality. As you can see, these ‘corporate champions’ have come up with some original ideas, enabling them to engage the consumer by idenfiying shared values and or interests despite there being no immediate connection to basketball itself. They provide inspiration for future campaigns focused on cross platform engagement.